This morning following work I made a quick run over to Sanibel Lighthouse to see if any migrants could be found. I figured that it would either be hopping or dead and I was right. It was dead. Seems that the winds are blowing the birds past. We had a weak storm front overnight, that proved not to be a stopper. Found zero warblers and the only other birder on-hand, John of Ft Myers, did have a male summer tanager. I dipped on the tanager, but John lead me to the Eastern Screech Owl, who posed nicely for us, out of her nest hole in a dead palm. Magnificent Frigetbirds were also on hand. Had only paid for an hour's parking, so I was on my way home by 9:00am. But I could not resist a brief stop at Bunche Beach. Found several Black-bellied Plovers, Sanderlings, Semipalmated Plovers and Dunlins. Had a few Brown Pelicans, Laughing Gulls and a lone Ring-billed Gull. Not many Ring-billed Gulls on hand these days. On the flats to the south rose a huge flock of Black Skimmers, perhaps 200 or more. A Bald eagle was sitting in one of the snags nearby the skimmers. This all about ended my birding for April laving me with a count of 141 birds. Had attempted to locate the scarlet ibis at Lakes Park last Tuesday morning were Bob Pelkey had the bird. Saw lots of Anhingas, White Ibis and other waders, but the scarlet ibis was not to be seen from the trails.. Note the dark feathers of the axillaries (under the wing) This a good way to differenceate the Black-Bellied Plovers, common here and American Golden-Plovers, which are not commonly seen in Southwest Florida. Both of these plovers can be very difficult to diferenceate while in Basic molt. Following this morning thundershowers my daughters and I headed to Ft DeSoto Park hoping for some increase in migrant activity. These kind of storm fronts can bring down migrating birds needing to find safe haven and DeSoto may have been impacted. The word was that the park has been slow on migrant activity most of the month, but we did find a good variety with this weather event. No fall-out but a good day for birding. Did not get on scene till 12:30 pm, with the first stop at the East Beach turn-around. A good variety of shorebirds were around including Common Terns, Royal Terns, Sandwich Terns, Least Terns, Willets, Short-Billed Dowitchers, Dunlins, Black-Bellied Plovers, Semipalmated Plovers, Sanderlings, Laughing Gulls, Brown Pelicans, Barn Swallows, Ruddy Turnstune and a lone Least sandpiper. We headed then to the East Beach Woods which was fairly busy with migrants and birders. We quickly found Black-and-White Warblers, a beautiful male Chestnut-Sided Warbler and a female American Redstart. Several Rose-Brested Grosbeaks were busy at a small mulberry tree and several Summer Tanagers, a Scarlet Tanger and Blue-Headed Vireo present as well. Several birders came in off the Privet Trail telling about ovenbirds, kentucky warbler and a bay-brested warbler that were seen. Also several people were commenting on a reported warbling vireo and a blue-wing warbler. Dipped on all of these. Katie and I entered the Privet Trail, were Katie immediately spotted a beautiful male Indigo Bunting. we also found more Summer Tanagers and a Northern Waterthrush exploring water puddles. Several small brown birds were a bit difficult to id, but I believe that they are female Indigo Buntings. We moved onto the Mulberry Grove were only a Gray Catbird was seen, however another birder put me onto a beautiful male Black-Throated Green Warbler and a pair of Yellow warblers in a live oak inside the ranger resident's yard. As we were watching, a male Blackburian Warbler joined in with the other warblers in the tree. As I have never seen a blackburian warbler before I had a LIFER. Next Katie and I checked out the nesting Great Honed Owl at the North Beach Woods. The parent owl gave great views and the owlet could be seen but it did not stand up. Before heading for home we rechecked the East Beach Woods. Ran into three members of the Caloosa Bird Club, whom I had gone on a birding trip back on March first. They had a great list for the day including the blue-winged wabler and swainsen's warbler. We reentered the Privet Trail with very little to add, but several Eastern Kingbirds and what I believe is an Eastern Wood Pewee. There was some questioning that the bird was a willow flycatcher. As we were exiting, another birder told us about locating the blue-winged, a bay-brested warbler and a pale, female cerulean warbler, just around on the adjacent trail. Too tempting. We set out, but I had to get back to car before the search was ended. So I said fairwell and we headed for home. I am cureous if the bird club folks located the cerulean. On trip up to the park we had spotted a Roseate Spoonbill, Magnificent Frigatebird and a couple of Swallow-Tailed Kites. Some hoped for birds we can add to the dip-list included any baltimore orioles, blackpoll warblers, cape may warblers, black-hooded parrots and gray kingbird. With the weather finally warming up, the reptiles and amphibians are becoming active. The gators are moving around as they are entering breeding season and looking for food as well as mates. They often do not eat at all during the cold months. Snakes, lizards, toads and frogs are now showing up. Found this scarlet kingsnakes on the road to work last night. A beautiful animal. On a more negative note my daughter Melissa's future in-laws lost a one of their dogs a week ago to a cottonmouth bite. It was struck twice on the face and the vet could not save her. These snakes are very aggressive and dangerous. This Eastern Diamondback Rattlesnake was sunning itself at the entrance to Blair House at Corkscrew Swamp Sanctuary back in December. Note how well it camouflages into the landscape. Even in the enlargement it is difficult to see it well. 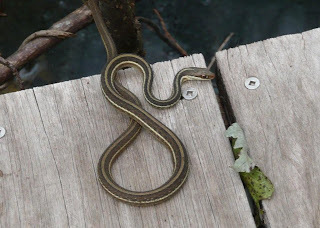 Another snake photographed at Corkscrew Swamp was this Florida Ribbon Snake. My nephew John, a post-grad student in Biology at Texas Tech took these next two photos of rattlesnakes while on a research trip to New Mexico last year. Photos borrowed from his facebook page. At a recent visit to Six-Mile Cypress Slough, Katie took these photos of anole lizards. A Green Anole. A native lizard that is disappearing and being replaced by the invading Brown Cuban Anole. The family headed over to my folks place on Little Grassy Lake in Highlands County, just south of Sebring. This was a last chance to visit before them before they head back to Illinois for the summer months. Our visits to their place often was rewarded with some great birds. Like Sandhill Cranes, Great Egreats and White Ibis. Their neighbor keeps a purple martin house which unfortunately is also home to nesting house sparrows, but Purple Martins are nesting. Also nesting is a pair of wood ducks with 20+ eggs in a wood duck box attached to their boat house. White-winged Doves, House Sparrows, Blue Jays and grackles were present all afternoon. I will get to see them again very soon as a family wedding is scheduled in the Chicago area in about three weeks, which is a great excuse for a few vacation days next month. Some birding is scheduled up there with grassland birds like upland sandpiper, boblinks, dickcissels and henslow's sparrows of interest. Other species of interest include various warblers, swans, yellowheaded blackbirds and black terns. After taking care of some business I headed over to Corkscrew Swamp Sanctuary in Collier County to see if there was any interesting warbler activity. Could not get there till 10:30 am and found the number of visitors to be way down since my last visit. Reason being that so many snowbirds have already headed back north. At the butterfly garden, at the entrance to Blair House, I was informed that I had just missed a hummingbird. After a short wait, I can always try again when later, on the hummer I went inside to pay. Here I was rewarded with a male painted bunting at the feeders behind the building. Grackles and Red-bellied Woodpeckers soon took over and ran it off. Waited at the feeder for a reappearance of the pair of Shiny Cowbirds, that I had just missed. Pushed on, as I could try again on my way out, for the cowbirds. At the feeders I met up with Jeff, an ex-patriot Brit and snow-birder from New Jersey, whom I had walked with on a prior visit. Later on we were joined by a lady from Michigan, who had just flown-in to search for property in Cape Coral (residential property here are at fire sale values with the collapse of the local housing market). She was a very experienced birder and had plans to attend a birding festival at the migrant trap at McGee Marsh in Ohio in a couple of weeks. We found the water level to be very high today, so few waders were to be expected. Had hoped for some nightherons, but only a sole Little Blue Heron and a sole Great Egret were seen. Noisy and soaring Red-Shouldered Hawks were very evident as were calling Gray Catbirds, White-eyed Vireos and Carolina Wrens. A scope was set up at a Blue Gray Gnatcatchers nest for visitors to use and where we were able watch the gnatcatcher harrass a Red-Bellied Woodpecker that was much to close for the vigilant gnatcatcher. A couple of Great Crested Flycatchers were seen and heard. As for the warblers they were found high up in the canopy of these ancient cypress trees. Heard several Northern Parulas and actually could only locate a beautiful singing male as the emerging foliage did make the birding more challenging. One warbler we found as Black-throated Green Warbler. We were able to add a Black-and White Warbler and a calling Pine Warbler. A suspected tennessee warbler, only seen from directly below, I am now convinced was the similarly looking Red-Eyed Vireo. Several FOY Chimney Swifts were seen and heard. It was a good day with a few interesting birds, but not a great variety of warblers. One very interesting observation was a white-tailed fawn and doe grazing right next to the boardwalk. They were very tolerant of the walkers. Left at 2PM without the shiny cowbirds or hummer, but was satisfied with an enjoyable walk in great weather. Won't be long till the daily 90+ degree temps, high humidity and afternoon showers reappear. Headed over early to Babcock -Webb Wildlife Management Area for the trifecta - Red-Cockaded Woodpecker, Backman's Sparrow and Brown-Headed Nuthatch. The woodpeckers were very cooperative at the first colony on Oil Well Road. Had three active woodpeckers included a young bird picking throuh the gravel on the road. Also had a Bachman's Sparrow present by the colony. Found a a singing male later on that morning. The Brown-Headed Nuthatch has much harder to locate. Several other birders I talked with were also dipping on the nuthatch. But I managed to locate one shortly before heading to home. For some reason this little bird was stalking a Red-Bellied Woodpecker. Following him from limb to limb. Eastern Towhees and Great-Crested Flycatchers were plentifull. A young Bald Eagle was observed setting in a snag. Missed on any warblers and northern bobwhites. Hooked-up with the Lee County Bird Patrol event this morning at Bunche Beach. These walks are very informative and with Charlie Ewell leading the group you will learn your shorebirds. I know that I did. The tide was low and the air was a bit chilly. However, the bird density was very light for low tide. Obviously much of our shore birds have headed north. We still had some variety though. A lone American White Pelican made a flow over as did a couple of Roseate Spoonbills. Dozens of Brown Pelican were in a feeding frenzy at the south end of the beach when we started out. A few Double-crested Cormorants were busy diving for breakfast. The loons and red-breasted mergansers were already gone for the season. A couple of spotted sandpipers of worked the sandy area at the north inlet. The usual waders were all present included White Ibis, Reddish Egrets, Great Egrets, etc. Further north on the exposed mud flats were a good sized flock of Black Skimmers. A few Laughing Gulls and lone Ring-billed Gull were flying as were three Least Terns, new arrivals for the season, plus a couple of Royal Terns and a one Sandwich Tern. A few Black-bellied Plovers and Semipalmated Plovers were present. Sanderlings were probably the most numerous shorebirds on hand. Eastern or Western Willet ? But the time was spent concentrating on the Willets. Both Eastern and Western Willets. Charlie enjoys teaching on the subject. This time of the year Eastern Willets are showing up as the Western Willets are moving on to their breeding grounds out west. So both breeds are present and can be confusing to separate, especially as they are in various stages of molt. After work on Sunday headed over to Six-Mile Cypress to look for any migrants. But first checked out the rest stop on daniels road and I-75 for Black-Necked Stilts any other waders. Did find a few a few stilts presents but no ther waders were there this morning. The parking lot at Six-Mile was empty of people and birds. As for the weather we were in-between morning rain showers. The boardwalk had lots of Northern Cardinals and Gray Catbirds. A couple of Carolina Wrens were very vocal as was a busy Pileated Woodpecker. As for migrants I was lucky to get excellent looks at a male Black-Throated Blue Warbler and a very brief look at a Chestnut-sided Warbler. I have not really heard of chestnut-sided warblers traveling through here before, but I am pretty confident that it an accurate siting. Came back on Monday to try and relocate the black-throated blue warbler and chestnut-sided warbler. Spent a couple of hours on the boardwalk, but the only warbler seen today was a sole Black-and-White Warbler. Other observations included the resident Red-shouldered Hawks seem to be nesting, lots of Gray Catbirds are still present and a Barred Owl became very vocal. As a county employee, I was required to take a furlough day, which is today. So I chose to visit Ft Myers Beach's Little Estero Lagoon to seek out snowy plovers. Arrived early to avoid the day's heat and the spring break crowds. The birding started out slowly. Just a few waders and no shorebirds. As I reached about midway the numbers increased, but still not very birdy. The skies were clear and only a few gulls and terns were about. A pair of Ospreys kept busy hunting for breakfast. Had about six, high flying, but noisy Least Terns. These were the first that I had come across this season. The beach was already prepped with demarcated zones for nesting seabirds including the least tern, snowy plovers and Wilson's plovers. So several hundred least terns should be arriving soon. Found Sanderlings, Semipalmateed Plovers, Wilson's Plovers, Black-bellied Plovers and about six Piping Ploves. But no snowy plovers today. Had been hearing a serinadeing Prairie Warbler and a couple of Palm Warblers were active. I have wondered if sedge wrens were found here. Seems that there is some suitable habitate, but I am no expert on this subject. I have never found one to date. The reason for the title to this article was that the Peregrine was my last siting before heading for home. Another birder had it spotted high up on the ledge of one tall condo buildings that line shore. It's spring migration time and sometimes birding can be fun. It's just a matter of right place at the right time. One good spot is Ft DeSoto Park in Tampa Bay. Headed up there on Monday arriving about 8:30am. Could only stay for a couple of hours. The resent news was about the hundreds of Hooded Warblers that had descended on the island. Other visitors included Worm-eating warblers, Prothonotary Warblers and a Blue-winged Warbler among the reported sightings. A brown-crested flycatcher had been reported regularly for about the past two weeks. But with the nice weather, I had already figured the migration counts would have shrunk. And so it was. Checking the Terra Vierde ponds showed that almost all of the ducks are gone. Just a few Ruddy Ducks, Lesser Scaups and a few Coots. Had fly-overs of Black-hooded Parakeets at the ponds and twice within the park. Don't know if it was single flock following me around or several flocks. Put a few miles on the car and several hours in, in search of birds. Had a bit of luck in twitching after rarities, but seemed to have missed out on most. Missed the smooth-billed ani, twice in the Everglades, and the laSagre Flycatcher at Key Biscayne. My best find was the Harlequin Duck that had wintered in Sebastian Inlet. Just last week, at Sanibel Lighthouse, we were able to find several Northern Parula, Hooded Warblers and even a Worm-eating Warbler. So the migration has begun. We even found very large numbers of exhausted Purple martins and Barn Swallows.